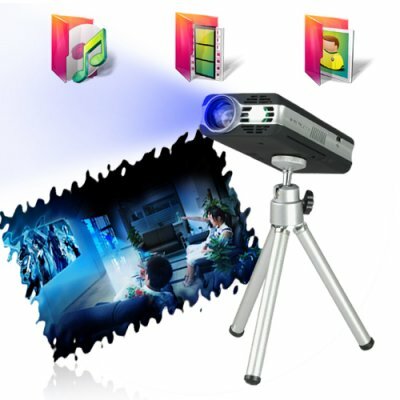 Successfully Added 4 GB Mini Multimedia Projector with Micro SD (Slim Design) to your Shopping Cart. 4 GB mini multimedia projector with micro SD slot and a smooth slim design for excellent on-the- go use. This powerful and durable little projector comes with 4GB of built in memory, with an additional micro SD slot located on the side of the projector. The CVIK-E26 micro projector is ideal for both business and social use. If you ever needed to make an outstanding presentation with quick setup, then this high performing simple plug and play micro projector is exactly what you need. The special slim design of the CVIK-E26 enables it to fit nicely into your laptop bag. In addition to its slim, small and portable design, the CVIK-E26 comes with an internal multimedia system that plays an array of media file formats, which lets you enjoy watching videos in a cinematic large projection display up to a maximum of 2.5 meters diagonal display. Make the most out of using this micro projector, you can either use your favorite earphones to enjoy listening to the audio, or through your stereo system by using the RCA cables provided. This is a must have item, whether you're a business or media orientated individual, and is available to you for single or bulk purchases, straight from the leader in direct wholesale electronics, Chinavasion. How can I use the mini projector independently without my computer? When you switch ON the mini projector, just press play and hold down for a couple of seconds, the media interface will power up, then you can use it to view your media and work files. How long is the bulb life for this mini projector? The life of the bulb for this projector is, on average, 5 years. If there is a problem with the bulb during that time, please contact us. i had my doubts, but is completely worthy, image is great, size is incredible. a must have, period. Splendid item, a real dream. I am very pleased one more time. on 2009-11-15 21:15:53 The Excellent projector, for such size particularly! In general, my assessment is positive. The image projected on the screen diagonal of 90 ", a completely dark room, looks really bright. Brightness more than I could have expected! A distance of half meter from the screen mesh is almost negligible! When connected to a computer, no problems arose, the device is detected automatically. Noticed screen burns very quickly (but gone within a short time). very hot when projected on the ceiling, but when projected on the wall temperature is kept at a fairly low level still, throughout the viewing. With half the distance meter, visible instability of the static image. From a distance of 1 meter, the instability is almost negligible. In general, you can close your eyes not small flaws, and enjoy the superb image! I would have bought himself another such projector, or even more if it cost 280-290 dollars or in the area! on 2009-11-13 23:35:49 Incredible Device - worth every penny! Definetly as described! Very fast shipping! Received in Kansas within a few days of order. I am providing this writeup to those who may be skeptical about the quality of this device. I would absolutely recommend it to anyone who has limited available space or is looking for a travel projector and also, it is definitely an 'ultimate geek' must have. I use it in a transient environment and every individual that sees it wants it, everyone has had the same opinion that it is worth the price and offer to buy it from me.